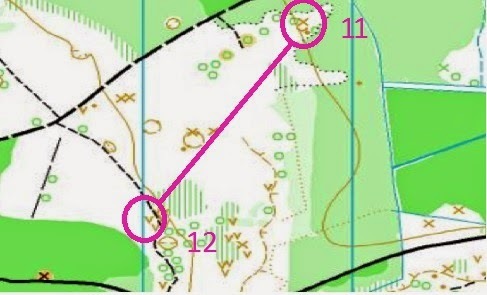 Aiming off is an important skill in orienteering, especially when crossing blocks of forests. If you know a control is beside a wall, you know you need to run to the wall, then along it to reach the control. However, it is unlikely you will hit the right place exactly, so by aiming off to one side, say to the East, you know you will need to run West along the wall to reach the control. 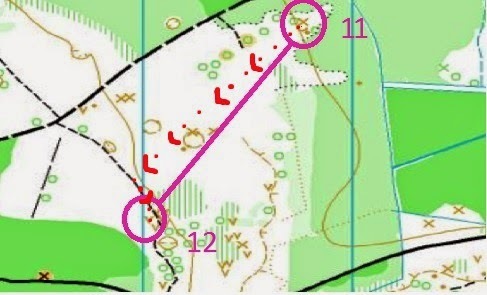 In the leg above, the route following the pink line allows the runner to know exactly which way to go to get to the control, once he reaches the wall. Aim off to the North, then follow the path down to the control. So try using aiming off next time you find a leg like this on a course. 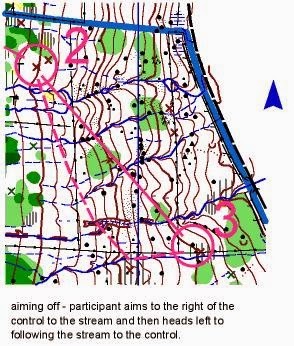 (it could be very useful at Somerset Forest for NICS 3 of 2014, which has lots of open, flat forest between long, straight paths.